Larger seed beads, such as 6/os and 5/os are often referred to as “E” Beads. An E Bead is approximately 4mm in size. 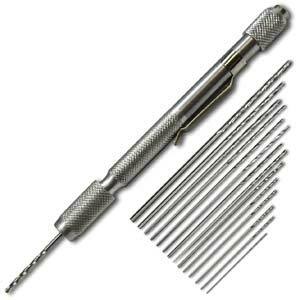 I often need to use a micro drill bit set like the one shown below. The main thing I use it for is to open the holes in pearls a little bit. Pearls have such tiny holes, and sometimes even a 24 gauge headpin will not go through. By starting with the smallest bit in a micro drill bit set, I can gradually work my way up to a larger size bit and enlarge the hole very easily. The drill bit sets such as this and the 20 piece replacement set have confusing numbers – the 12 drill bits in the set are sizes “52 – 74”. Some sets say, “.0635 – 0225.” But what does that mean to you? This is a drill bit size chart – and it will tell you in millimeters, inches, and the number designation, as well as a few suggestions as to how to use different drill bit sizes. I have found this extremely useful!